Hey all, I thought we'd start off 2012 here in the Fake-n-Bake kitchen by making some sandwiches, cheese sandwiches to be exact. Let's start off with the bread, we'll get to the cheese later. This bread was made for our recent production of 'Next to Normal' for a scene in which a woman is making sandwiches on the floor. You know, like you do. I had a lot of fun playing with all of the samples over at Active Foam Products, and I chose an upholstery foam with a color and texture similar to angel food cake. 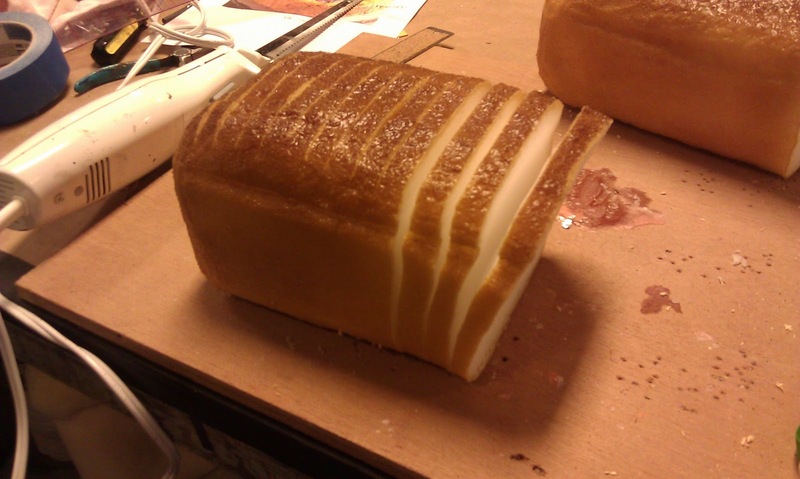 After putting in an order for a thick slab of the foam I wanted, I began plotting my bread loaves. The first step was to carve the foam into shape. I did this using the band saw, the foam saw, and my trusty Olfa knife. The foam will dull the utility blade quickly, but you can help to mitigate that by putting a little bit of sewing machine oil on the blade to lubricate the cuts. It helps make cleaner cuts, as well. (That's a tip I learned from Marit A. Thanks, Marit!) Otherwise, change the blade often. I also highly recommend using a curry comb for carving. 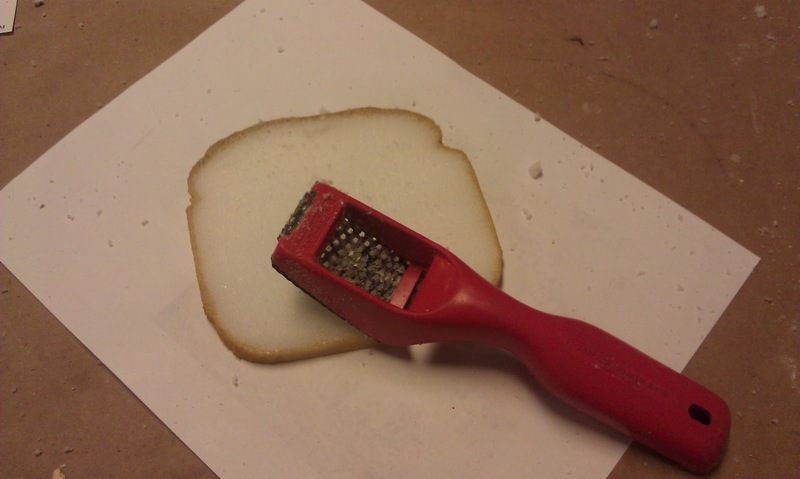 It shapes very nicely, but does leave grooves in the surface of your foam shape. Since the bread was going to be reset in the bag every night, I tried to make the loaf as uniform as possible along its length, and square off the ends to avoid oddly tapered end pieces. To make the crust, I went with my bread crust go-to, latex. I used casting latex from Cementex, but any liquid latex should do the trick. 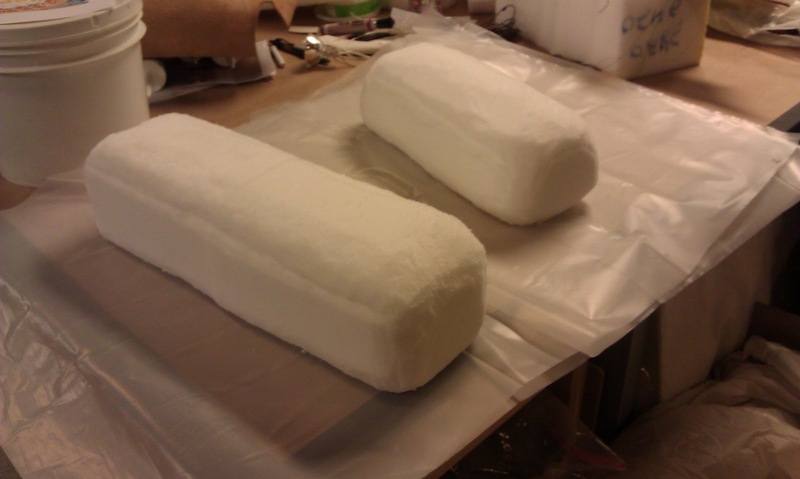 I gave the foam several liberal coatings, letting the latex dry between each. I wanted the crust to be smooth enough to look....well, to look like crust. The next step, and the fussiest, is the slicing. I was really hoping to slice these bad boys on the band saw: set up a fence, zing them on through. Alas, the band saw grabbed at the soft material and ripped it to bits. After attempting a few other methods, I found one that worked. 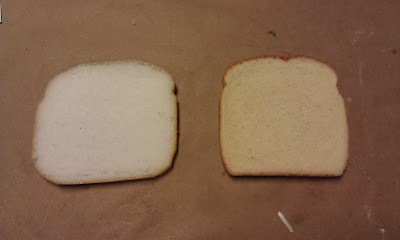 After carefully measuring out half inch slices, I used an X-acto knife to cut the thick latex crust on the top of the bread. Then, I very carefully used the electric carving knife to finish slicing through the loaf. The carving knife slices very evenly, but you have to be careful to keep it going straight, or your slices will be all wonky. Once the slices were done, they were still a bit too smooth, so I took a rasp to them to give them some texture. The one on the right is the real one. The final touch on any processed-food prop is the packaging. 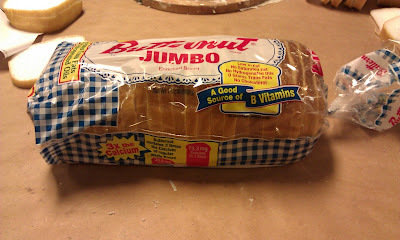 Bread packaging is easy, you go to the store and buy a loaf of bread. You take the real bread out of the package, wrap it, and put it into the green room. This works well for everyone: you get a bread bag to use, and the interns get free toast for a few days. Hurray! There is something else I should note, here, and that is the problem of oxidation. The white foam that I used yellows over time when exposed to air. It is likely that I won't get more than a show's worth of work out of these slices. I would like to do some tests in the future to find out if a sealer of some sort would prevent this, but I didn't have the extra time on this show. So there you have it folks, bread ala Anna. I've had a good little run of food projects lately so I've got cheese, olives, and tacos coming your way soon. Happy New Year, and Happy Propping! I'm the theatre teacher at Brown Deer High School and I've been searching high and low for fun fake food projects for my tech class. I was hoping I could pick your brain for some ideas. Possibly even bring you in as a guest educator! We're only a few minutes away from the Rep. Do you guys run workshops at all? Desserts are always fun, I think. There are lots of things that you can do with just a few supplies. Why don't you drop me an e-mail at propsanna@gmail.com, and we can discuss it that way? I'm glad you like the blog! I know this is Necroposting, but I found this extremely helpful. Also I had some matte brown fabric paint and I tinted the latex, it really added some extra dimension to the golden brown crust. Thanks again!